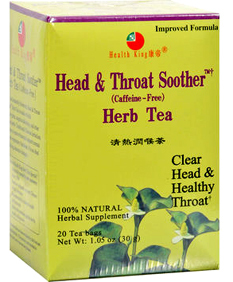 Head & Throat Soother Herb Tea, 20 tea bags (Health King) - Penn Herb Co. Ltd.
Head & Throat Soother Herb Tea is an ideal drink for the coldweather season. It's made of precious herbs used in Chinese medicine to maintain normal nasal & respiratory functions. 100% Natural. CAFFEINE FREE. AMOUNT PER SERVING (1-2 TEA BAGS): Proprietary Blend 2-4g: Loquat Leaf, Cimicifuga, Peppermint, Momordica Fruit, Notopterygium, Angelica, Jasmine Flower. Maintains normal nasal and respiratory functions. HEALTH KING TEAS are Chinese medicinal blends based on traditional formulas. Steep in hot water for 3-5 minutes for hot tea. Steep in hot water and refrigerate for ice tea. Use 2-4 bags a day.